I came up with this recipe when I couldn’t find quite what I was looking for anywhere else. I had to make several batches of these muffins before they came out the way I wanted, but it was worth it! 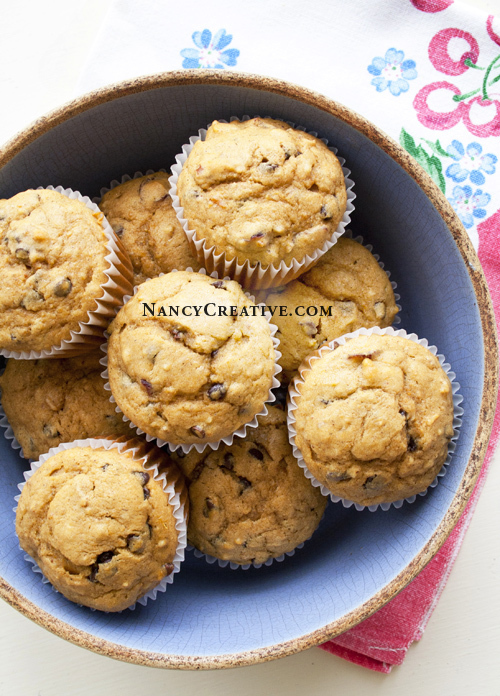 These are really yummy muffins made with canned sweet potatoes and “loaded” with dried cranberries, mini chocolate chips, and finely chopped pecans. They’re a real treat for breakfast, brunch, or snack time. These Loaded Sweet Potato Muffins are great to make all year round, but I’m going to keep these in mind for Thanksgiving time, too…since I usually make alot of things with sweet potatoes and cranberries that time of year. You’ll end up with 19-20 muffins when you make this…about 1 1/2 dozen. Here’s the recipe…enjoy! Preheat oven to 350 degrees. Line 2 muffin tins with paper liners (the second tin will only need 7 or 8 liners). In large bowl, add mashed sweet potatoes, brown sugar, and softened butter; blend until smooth. Add eggs and vanilla and blend well. In medium bowl, mix flour, baking soda, baking powder, salt, cinnamon, and nutmeg, blending well. Add these dry ingredients to the sweet potato mixture in the large bowl. Add milk to sweet potato and flour mixture, stirring until blended (don’t overmix), then fold in the cranberries, mini chocolate chips, and chopped pecans. Fill the lined muffin cups 3/4 full. Bake at 350 degrees for 18 to 20 minutes or until toothpick inserted in center comes out clean. Serve warm. 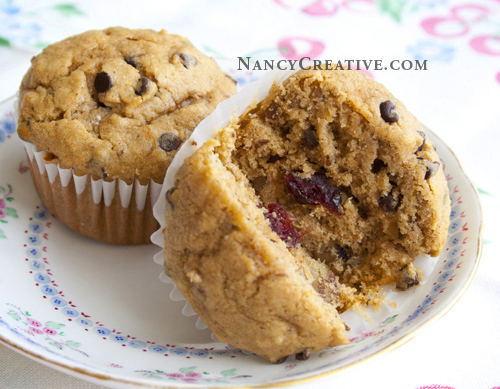 Enjoy these muffins loaded with lots of yummy things inside! Do you like making muffins? What’s your favorite flavor? 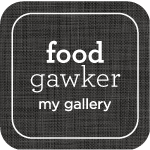 This entry was posted in Autumn/Thanksgiving, Food and Recipes, Muffins, Biscuits, Scones, Seasonal and tagged baking, brunch, Chocolate chip, Everyday, muffin, Sweet potato on May 6, 2012 by nancyc. I like making things with sweet potatoes, too–they’re so good, and healthy, too! Yes I do like making muffins; generally blueberry, pumpkin or zucchini bread muffins. But these look like the go! Blueberry muffins are a favorite of mine, too! Hope you like this recipe! 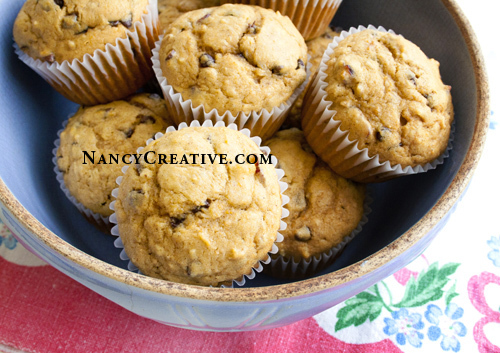 I love traditional blueberry muffins the best, although a few weeks ago I made rustic (i.e. chunky) apple pecan muffins and those were yummy too. These look great too! If I use fresh sweet potatoes, what should I do with them to get perfect batch? Baked or steamed? You know steamed sweet potatoes taste like more watery than the baked ones. I only have dcc in hand, so I hope it can work well to substitute chocolate chips. Well, I’m not sure if it would make a big difference, but it might be better to steam them so they’re not so dry. I would probably boil them myself, since that’s how I usually make mashed potatoes, and you’ll be mashing these for the muffin recipe. So, maybe you could try boiling them. The dcc should work fine in your recipe, too!